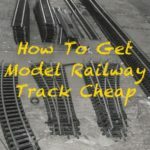 Looking for a cheap way to get buildings for your model railway? 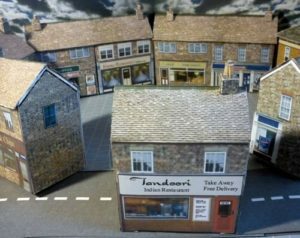 Paper and card building kits are simple to make, realistic and best of all there are lots of them available free just waiting to be printed. Yep, free! Here’s where to get them. Paper buildings are nothing new. They’ve been around for years, decades even. Metcalfe will be a familiar name to many. What’s changed in recent years, however, is that there are now loads of high-quality kits freely available on the Internet. You just go to one of the sites that offer them, download the file, print it; cut out the shapes and glue them together. 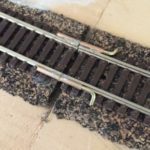 Free model railway card kits! This video shows how it’s done. It’s from one of the websites I’ve listed below. Better yet, once you’ve downloaded a kit you can print it out as many times as you like to have multiple buildings. Compare this to buying the traditional card kits and it can save a fortune. 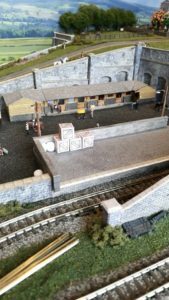 Better yet, you can get all manner of templates, from shops to houses and railway buildings, and even accessories such as packing crates, as seen in the photo below. Update: Since writing this, I now use this glue for card kits. It’s easily the best for card construction. So what’s the catch I hear you ask? Why would anyone offer downloadable model building kits for free? 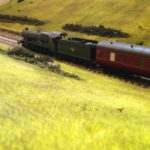 The general answer is they’re samples to tempt you into buying more templates from the supplier in question although in some cases they’re offered out of simple generosity by modellers for other modellers. So where do you get free building card kits from? Here’s the bit you want. 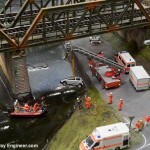 Here is where you can get free model railway buildings kits. Kingsway models offer a reasonable range of OO and N gauge paper card building kits. The link above takes you their sample page where you can find a semi-detached house, Underground station, shops and the insides of garages and underground stations etc. They also offer a range of free back scene images. 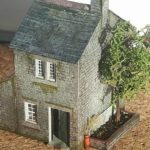 Only one kit, a downloadable PDF file, of an empty shop front from a building in West Yorkshire but it’s a great little kit and well worth getting if your layout is set in that area although it could fit into many other settings. Download available in N, TT and OO scale. It took me a while to figure out the navigation on this site – ignore the confusing messages in the middle of the web pages and just click on the building types in the menu at the top of page – but once I got there’s a great collection of town building types here. Some of the images seem a little blurred in the website photos but others, such as the modern retail premises under the industrial category, are great. This is definitely one for modern era builders to visit with many big name chain shops and branches on current high streets available – McDonalds, Tesco, ASDA, Nationwide, Currys and Argos to name a few. 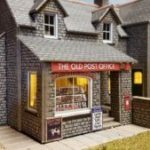 If this has wetted your appetite for card kits, there plenty of other related resources that will help with your model building. ghost-signs: Who doesn’t love old faded signs? 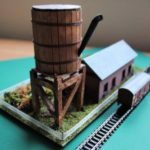 They’re a classic feature of many old buildings and now you can get them for your models. A variety of ghost signs are available at fairly reasonable prices with colouring to match the red brick of Metcalfe kits although with slight modification they could be used on other card kits. Posteriza: Not a kit but an application that allows large photos to be printed on an A4 home printer as a series of sheets that can then be glued together to make a long back scene. 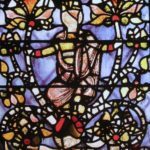 Texturelib: I’ve mentioned this site before but it’s worth talking about again. It’s a huge collection of high-resolution material textures, including brick, paper, stone and rock, that can be scaled and printed for your own scratch building. Definitely one to bookmark. If there’s one tip I can give you to improve card kit construction, it is to always change the blade on your knife or scalpel before cutting card. It’s surprising how quick blades become dull and even a slightly blunt knife edge can tear or rip card. Using a pristine new blade will give you a better finish. Try it now with one of above kits, use a blunt blade and then a new sharp and then share how you get on with a comment below. Photo: Top: Card Models By Tony, Bottom: card freight crates made by MRE community member Michael Dennis. Love the stuff on Texturelib but can it be used with Ho,1/72,1/76 kits and layouts? 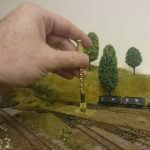 Does anyone know what percent I should set on the printer for t gauge if oo gauge is 100%???? Morwenna – T is 1:450 and OO is 1:76, so 16.89% (76 times 100 divided by 450) should do the job.